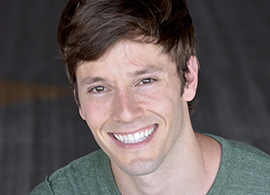 Thayne Jasperson is currently part of the hit broadway musical Hamilton! He was a finalist on So You Think You Can Dance, season 4, continuing on to the national tour. Original Broadway cast: Hamilton, Matilda and Newsies where he received an “Astaire Award” nomination. Thayne originated the role of Porthos for Broadway’s Finding Neverland. Other tours include: West Side Story (1st National) and Oz where he played (Scarecrow) along with stars from Danity Kane, Disney Channel and American Idol. Thayne was featured in hit film/ TV shows: High School Musical, HSM 2, Smash and MTV’s American Mall. For Thayne’s choreographic work he received a rave review from the NY TImes describing his work as “Ingenious!” Thayne continues to sing, dance, act, choreograph and teach whenever the opportunity arises.